Killer Characters: Happy Fall from Seattle! 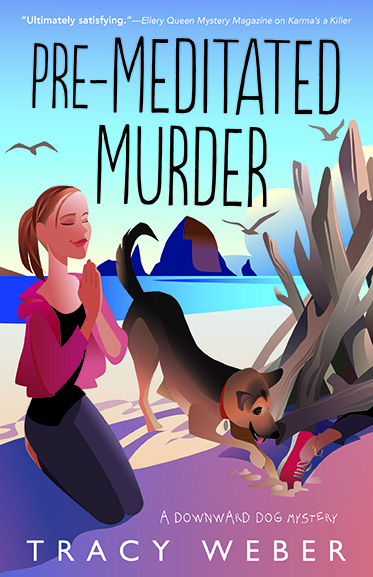 By Kate Davidson of Tracy Weber's Downward Dog Mystery Series! Hi all! Kate Davidson here, the yoga teacher/sleuth in Tracy Weber’s Downward Dog Mystery series, coming to you from gorgeous Seattle, Washington! 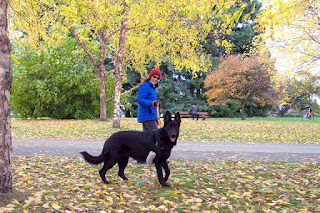 Fall is my German shepherd Bella’s favorite season. 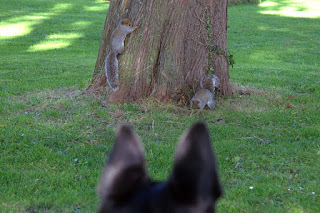 The weather is cooler (which is important when you’re a dark-haired, double-coated breed), the parks are less crowded, squirrels are out gathering their nuts , and the smell of moist dirt and plant decay are ever present to tease a German shepherd dog's senses. It’s also not nearly as rainy in Seattle as people are led to believe (Shush! Don’t tell anyone!) so her walks are longer and more relaxed. 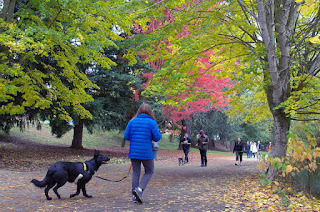 Bella’s and my favorite place to walk is Green Lake Park. 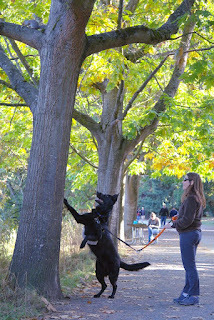 Bella and I are both camera shy, so my author friend Tracy Weber agreed to share some fall photos at Green Lake of her crazy German shepherd pup, Ana. Join them on their walk today, and Enjoy! 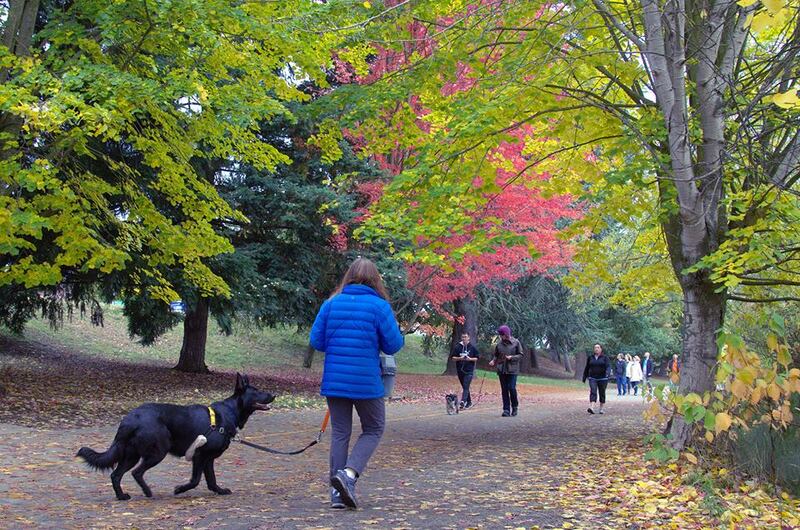 Green Lake Park's 2.8 mile walking and biking trail is home to hundreds of trees and plant species, and more wildlife than even the most athletic German shepherd has time to chase. But that doesn't mean that Ana Pup doesn't try! Fall is especially gorgeous, as the trees start to change color. Even better, the crowds thin. Even on less busy days, thousands of people visit the Green Lake each day. Tracy is almost always one of them. Ana makes sure of that. 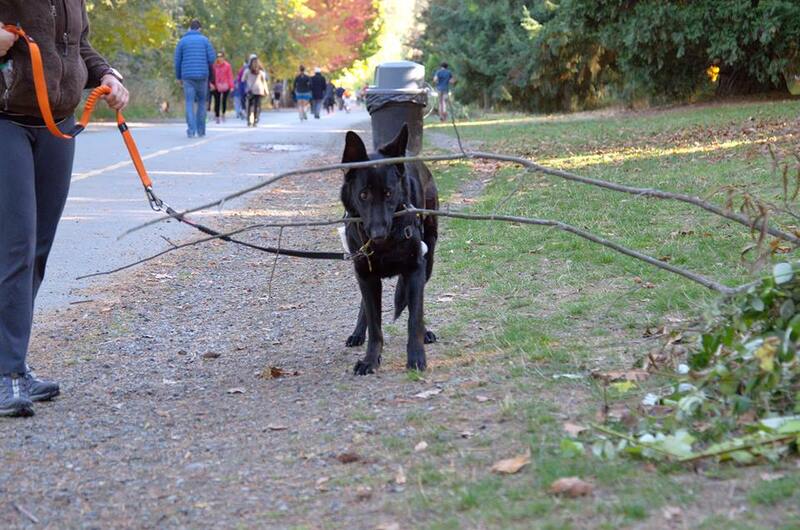 Where there are trees, there are also sticks. Lots of sticks. Ana likes to find the biggest possible. One of Tracy's friends calls her the "Branch Manager." The best part of any walk, however, is meeting new friends. 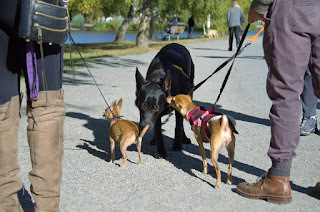 Ana introduces herself to at least ten on every walk. Tracy has no choice in the matter. 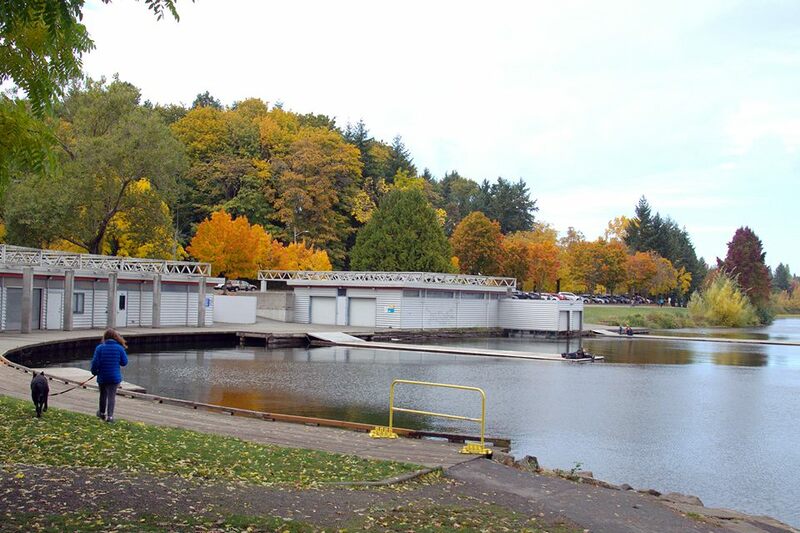 No lake would be perfect without boats, docks, and tons of watersports. Kayaks, crew races, windsurfing, and paddleboats. 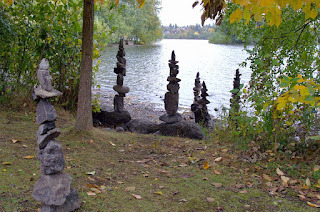 Green Lake has them all! 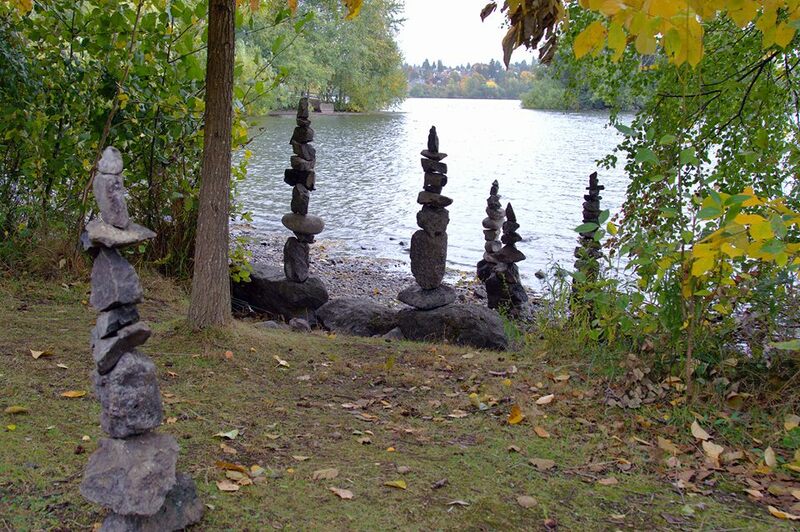 Occasionally, people add to nature's beauty with artwork, like these lovely stone sculptures. Ana wanted to knock them over, but Tracy prevailed. That's all for today's blog article, but if you ever travel to Seattle, take time to visit this lovely location. You might even run into Kate and Bella! Where is your favorite place to enjoy the fall colors? How about a contest! Leave a comment below mentioning your favorite fall location by Friday, November 17, and you'll be entered to win an autographed, advanced copy of Kate's newest adventure Pre-Meditated Murder. Be sure to leave your e-mail address so Tracy knows how to contact you to get your mailing address! Catch up on all four of the Downward Dog Mysteries. Available at booksellers everywhere! We have a wonderful park nearby that is also part of a trail system. It is so beautiful there in the fall. Living in New England is spectacular this time of year. But visiting Cape Cod with less crowd and gorgeous colors. Loved the first book and look forward to reading more. mlarkin (at) rmrgroup (dot) com. I live in south Florida, so it is a treat to go up to Maine for a week in October. My favorite fall spot is my yard. I have some fall flowers and trees with beautiful leaves. lndklbck at gmail.com. My favorite place for fall colors is in Michigan, both the lower and upper Peninsulas. Michigan is a beautiful state. 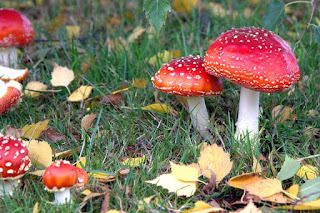 My favorite fall color location is our local golf course---since you are walking you have plenty of time to enjoy them. We have some beautiful local parks, complete with ducks. It's not all sunshine here in QLD. Thanks all for the comments so far! My pup, Joli, and I agree with Ana - Greenlake, Seattle WA has beautiful fall foliage! Lewis and Clark recreation area near Yankton SD is lovely in the fall combing a lake and fall foliage. I have always wanted to see a New England fall, but we have pretty ones here in Kentucky too. We love to travel the River Road in Grafton, Illinois. The bluffs that run parallel to the Mississippi River are ablaze with color this time of year and the river towns are hunkering down for the coming winter. Love the ambiance. Along the shores of Lake Michigan, the M-22 scenic tour...I grew up with vibrant fall colors in my backyard. Living in the South now, the colors don't seem to pop as much. Forgot to add my email address:. Cozynky(at)gmail(dot)com. I've lived in Orlando for over 20 years, so now I get my fall fix from the photos my family and friends in MA post on Facebook! Great pics of Ana! I wish my Dusty (white German Shepherd) were as well-behaved on leash as her! He prefers to run all over our 1.5 acre fenced-in yard off leash, chasing his roomie Ruby and squirrels, and picking up every branch he finds to run with it. Ana Pup is an absolutely gorgeous German Shepherd! Limited now to smaller, but no less feisty red Toy Poodle, only 3 months old..... No long walks this year! Thank you for sharing! Absolutely beautiful area you live in!! Our trees here in Oklahoma are finally changing and I am so glad! So far my favorite place to see the beautiful Fall leaves is right here in my current town Stillwater Oklahoma. There are so many beautiful trees in the neighborhoods here and I love to take rides with my husband and daughter to see the trees while visiting local Little Free Libraries! My email is Queenzhangziyi@aol.com thank you for this chance!! Berkeley Springs, West Virginia is a fun time this time of year with their apple butter festival and beautiful small town. 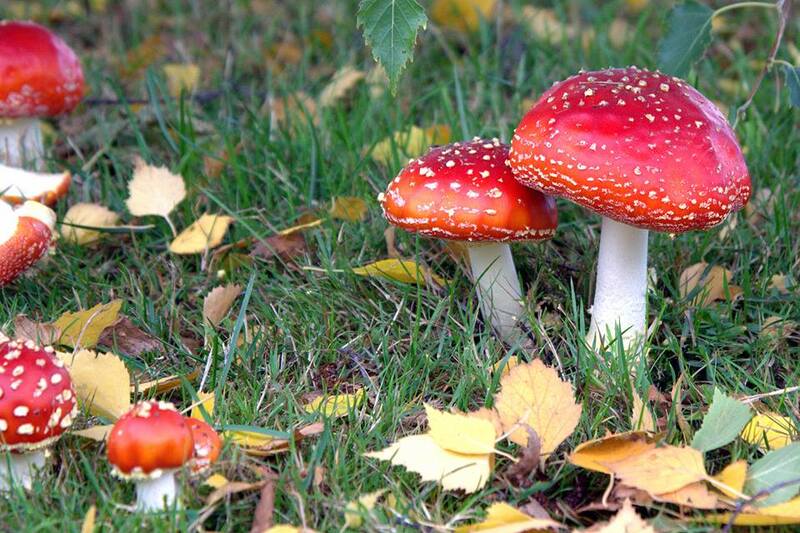 I've never seen Fall mushrooms!! The winner is Diane Casey! Diane, please e-mail me at Tracy@WholeLifeYoga.com with your mailing address and I'll get your advanced copy of the book in the mail!